As seems to happen every few months, the My Pictures folder on my computer starts to get a little too full... here are some different interesting things we've been eating out in Melbourne. Enjoy! Nyala is that African restaurant on the quiet side of Brunswick street that has been there forever. I visited once with my folks in 2001 (the pre-blog days), having read about it in the Cheap Eats. Back then, the Cheap Eats was my main guide to restaurants in Melbourne - how times have changed! We went a few months back at the behest of my bro's girlfriend Su who had received some discount vouchers. We got a banquet, which was great value. We were STUFFED and you can take away whatever you can't finish. African beers - Hansa on the left, Harar on the right. For desserts Su ordered a pudding (I forget the name, sorry), which had bananas, cream cheese and a hint of cocoa in it. But great choice, it was delicious! For myself, I was tempted by the South African milk tart. Not just because the accent rocks; I saw a recipe for it in Tessa Kiros' Falling Cloudberries some time ago and have always wanted to try it. As you can see, it was a bit broken, but still tasted good. The pastry was not too sweet (shortcrust, I think), and the filling was creamy and light, with a hint of cinnamon. I'm not too sure how necessary the whipped cream, choc ice-cream and store-bought choc sauce was though! We drove past here on our way home from the city, and remembering Thanh's enthusiastic recommendations, decided to stop in for dinner. The food was very impressive (although the coconut-cream based curries were too rich, even for my taste). What I did want to share with you though, was the desserts! We ordered "deep fried fruit salad" from the specials board, mainly out of curiosity. Here is what it turned out to be! Fruit Salad (i.e. Goldburn Valley tinned fruit salad), wrapped in spring-roll pastry and deep fried. It tasted nicer than it looked. But again, what is up with the unneccesary chocolate sauce and frozen boysenberries? The killer dessert here, however, was the amazing durian with coconut. Whilst in the CBD one night, a craving for dumplings took hold. Not willing to give the deplorable HuTong another go (average dumplings, terrible service), I decided to walk into Dumplings Plus. I used to come here with my parents back when it was Ye Shanghai. We ordered fried pork dumplings, fried chicken with rice and spring onion pancakes. I figured they'd be pretty good as we could see the ladies in the back making each dumpling by hand. As you can (probably) see, they were pretty crap. They had thick doughy skin, were unevenly fried, and they were all stuck together. I swear, the dough in between the dumplings was still uncooked! You'll see that the ones at the back didn't even get brown at all. ...but was still disappointing. The chicken was quite dry, and was really, really bland, even after adding the dipping sauce. The spring onion pancakes were ok, but really doughy. I've had better. Dumplings Plus. Fail!!! I'll stick to the burbs for my dumpling-fix from now on! We wanted cheap food after seeing Inglorious Basterds, and I suggested Es Teler. I haven't been here since my uni, non-pork eating days (all the food is halal). They have a good range of homely dishes and are really cheap. And I got to practise my abysmal Malay! (Which is pretty much the same as Indonesian when it comes to simple things). Chicken rice. I loved the super-hot chilli sauce (and the fact that there were 2 different types! ), and the chicken was both crispy and moist. The only thing I wasn't too keen on was the soup - it was quite thick, and had a flavour that I'm not used to. Perhaps it's a typically Indonesian soup? I'm not too familiar with Indonesian food in general. Ambrosia definitely doesn't count as a cheap eat (at over $20 for a main meal and mostly seafood offerings), but I wanted to share with y'all these awesome desserts we had there last time, courtesy of Jal the owner. The custard thing is a typical galaktoboureko (custard-filled phyllo), and the little puffs are yeasty donuts, soaked in honey syrup. Wow. A decadent dessert, best shared and eaten with a strong coffee! (We had a group of 7). 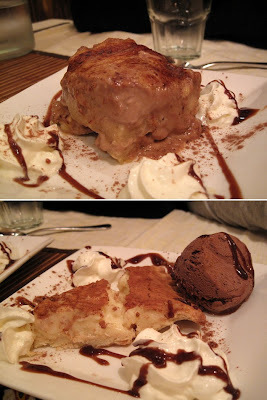 Oh and this is the post where I mentioned the "galaktoboureko"!! Let's all practise: GA-LAK-TO-BOU-RE-KO! Lol. I've walked past Nyala so many times before as well. I'm always tempted to give it a try, but then it's usually deserted (early in the night) so unsure how good it was. Must try it now. Thai taste rocks. You can't go wrong with anything that has durian though, that's my theory anyway. Finally, I used to love galatoboureko too. But now I have a new love, bugtsa. The one at Hellenic Republic is amazing, but I found one at Oakleigh that's pretty good too. I forgot the exact name of the bakery, but it's something like Coffee cake or something. At $6 for a massive bugatsa, it's damn good. what a great selection of dishes. The dumplings are a total let down. I love my dumplings and those are terrible! Hey Thanh - Nyala's pretty good! Not mindblowing, but good. The banquet always has waaay too much food. I just googled bugatsa - it totally looks like the type of dessert I would love!